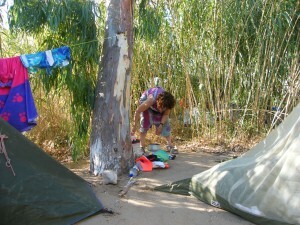 A busy camp­site, but very relaxed atmo­sphere. People sit­ting play­ing chess and back­gam­mon, 1970s rock music play­ing in the cafe, five minutes to the (swim­ming cos­tumes def­in­itely optional) beach. This entry was posted in Greece, islands by chris. Bookmark the permalink.